The funny thing about mayo is: like many other now tasty to me foodstuffs, I used to dislike it. It probably didn’t help that the first memory I have of it is on warm bologna sandwiches where it was gloopy and just plain weird. I think the first time I started liking mayo was when it was cold and used as more of a dipping sauce as opposed to a spread. For the record, extra crispy fries dipped into garlic mayo is a resounding YES in my books. 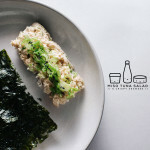 If you’re not a mayo fan, you have to try Kewpie mayo: the ubiquitous clear, red-topped squeeze bottle of mayo found in practically every Japanese household. 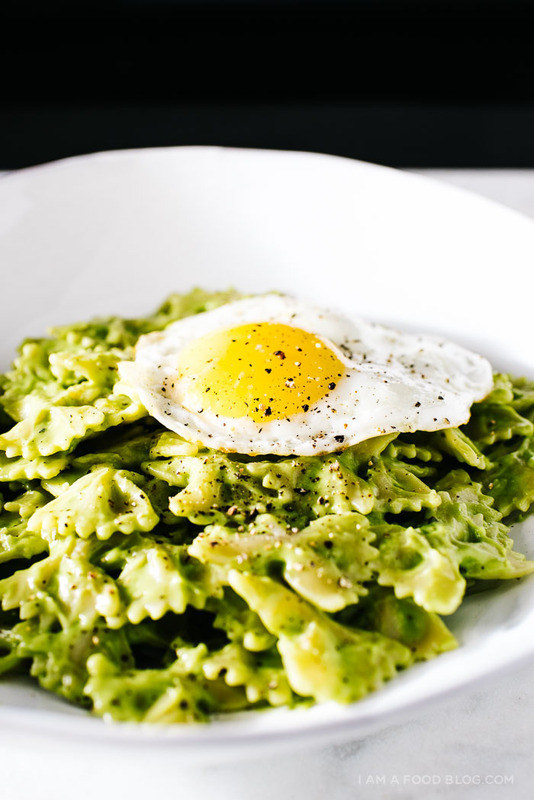 It’s tangy from rice vinegar, slightly sweet, and extra creamy. It is absolutely delicious and found on a bunch of classic Japanese dishes like takoyaki and okonomiyaki. 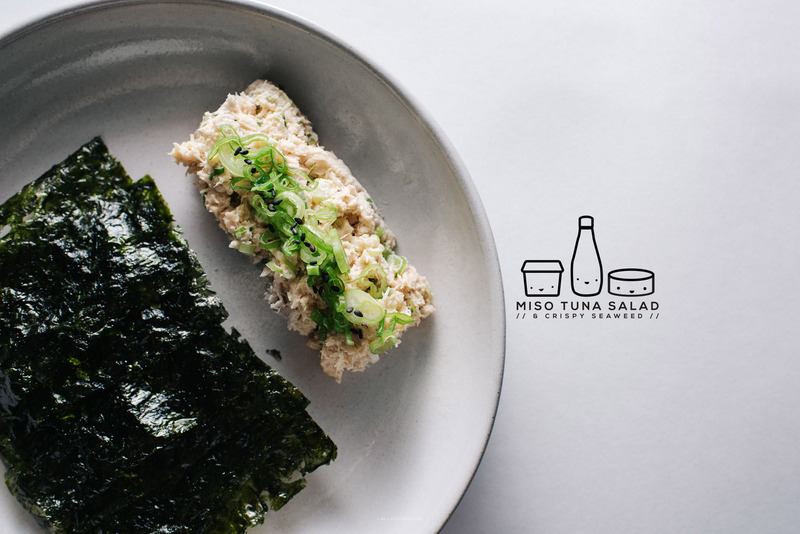 It works especially well as a stand in for anywhere your might use mayo, like this tuna salad. This salad is a little umami bomb and absolutely the perfect moreish no-carb snack. 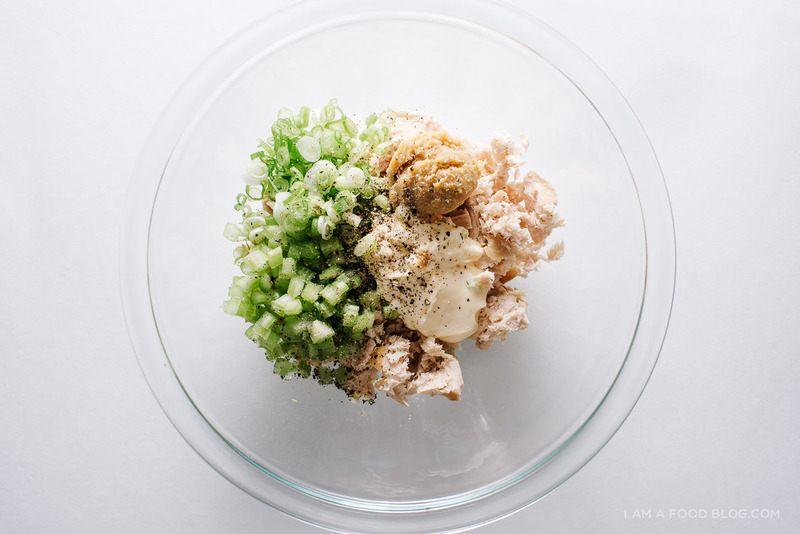 To a can of drained tuna, I stirred in a little bit of kewpie mayo, white miso instead of salt, celery for crunch, and green onions for bite. Instead of bread or crackers, I scooped it onto crispy seaweed. Super oishii! Mix together the miso and kewpie until smooth. Add the drained tuna, celery and green onions. Mix throughly and season to taste. Enjoy on it’s own or on top of crackers, toast, or seaweed. Notes: Adjust the miso content to taste, miso pastes vary greatly in terms of saltiness. Also, feel free to add more kewpie mayo if needed. 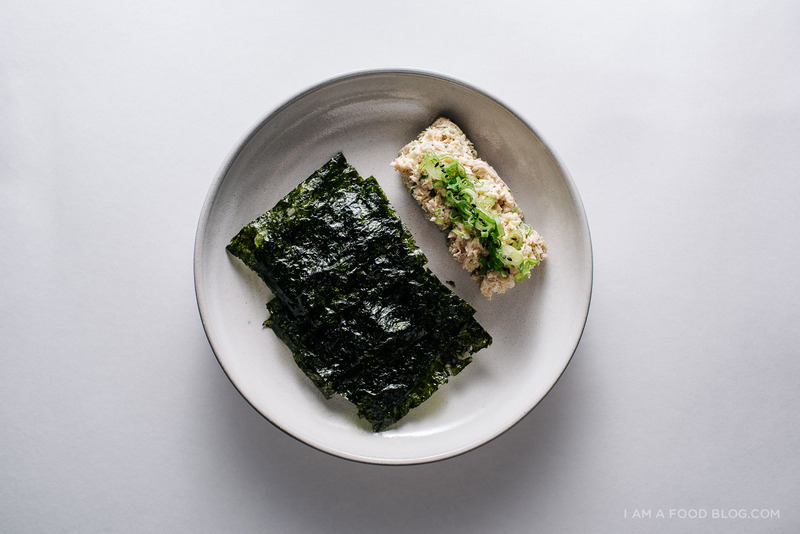 i love the flavor of miso, and korean seaweed can make anything taste good! will have to try this on a hot, lazy day. If you don’t have access to kewpie mayonnaise, would regular mayonnaise work ok here, too? yes, for sure! 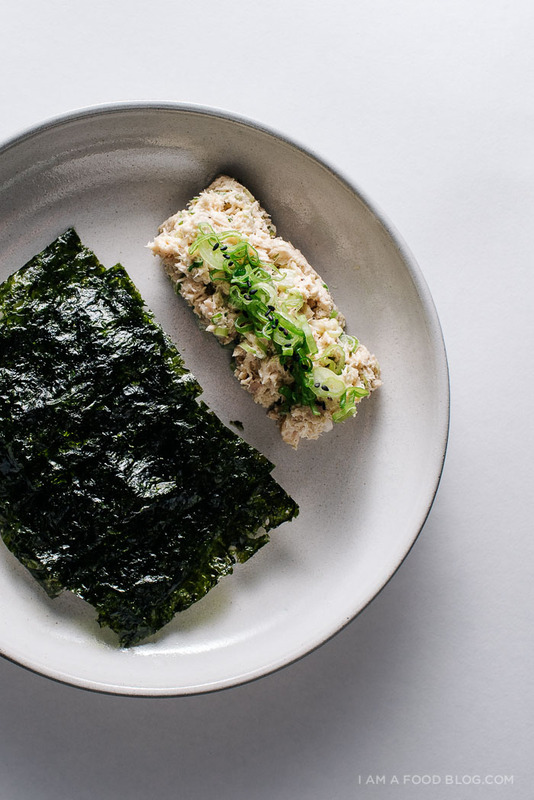 you might want to add a touch of rice vinegar and a pinch of sugar for a bit more of a kewpie mayo taste, but it’ll taste just as good with plain mayo. I’m with you – I used to be a big time mayo hater but I’m slowly coming around to it. I still don’t like super mayo heavy pasta or potato salads, but when I was in Chile (where they are mayo-obsessed) I had hot dogs slathered in it and they were actually delicious! I keep meaning to buy kewpie mayo – I pretty much love any Japanese food so I’m pretty sure I’ll be a fan! This sounds really great. Add a little rehydrated seaweed, some cucumber for crunch, a shallot, or??? I use Miso all the time in soups, stews, vegetables, etc. Keeps forever in fridge because it is so salty. It also comes in a lower sodium formulation which is what I use. Mayo-lover over here! Definitely want to try this, though I’d probably end up putting it all between a couple slices of bread. omg I LOVE this!! You make miso magic, lady — still not over that miso + mustard genius in your beautiful green bean salad, and now miso + MAYO (my favorite thing ever, lololol #fattylife). This is so great. I made this for lunch twice this week! I didn’t have kewpie mayo so I used light mayo and subbed the celery for pickled jalapeños. I made a basic tuna sandwich with it and it was SO EFFING GOOD. I’ll be making this all the time now. My tuna game has been forever changed. This was amazing! 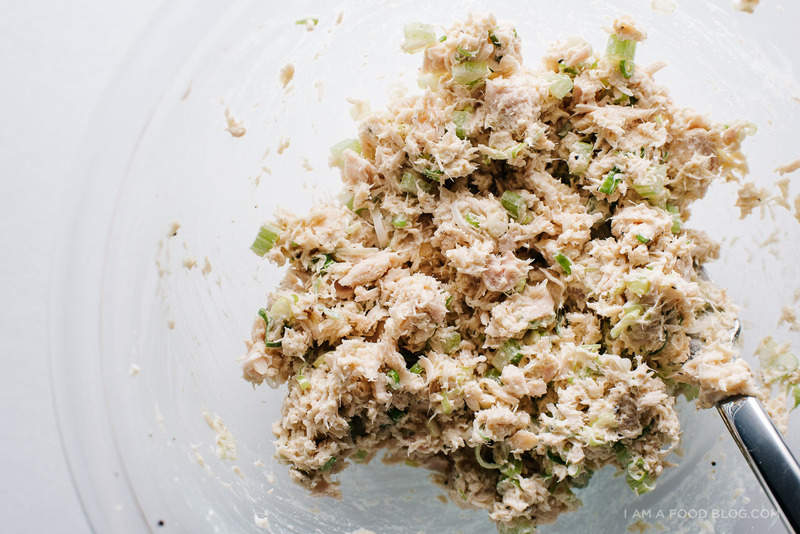 I hate canned tuna and am always looking for ways to make it good. This is exceptional. I had to make my own Kewpie Mayo from a recipe I found on serious eats and frankly had to sub a few items… I’d say straight Mayo with rice vinegar and Miso would recreate what I came up with. The Kewpie Mayo on its own was super unique and tasty but it didn’t stand up to the white Miso at all… Which is odd because it’s a spicier stinger flavor than American Mayo. Anyhow I just ate 3 cans of tuna and wanted to offer a big thanks and kudos for a great creation. This sound so good. I have never used miso paste for any meals that aren’t soups. I’ll have to try it soon!